Needs no introduction and remains one of Thailand's most exciting designs. The back nine is Thailand's best beginning with a short dogleg left Par 4 and finishing with the now famous Par 4 18th which is somewhat easy from the white tees, but a completely different hole from the back tees. 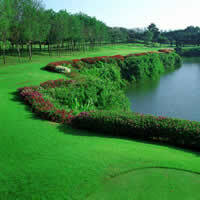 The Canyon Course is Thailand golf at its very best and a must play for any serious golfer to Phuket. No other course like this in Thailand. Every hole is memorable and the outside restaurant provides spectacular views of the course. If you play this when the conditions are good, nothing compares to this golf experience. The course conditions have deteriorated over the years and the course has recently had a lawsuit filed against it by one of the shareholders. Needs a kick up the behind and the new Mission Hills Phuket should provide that and encourage the owners to restore course conditions to their former standards.